Send this Exhilarating Bunch of Exquisite Blossoms to your close ones as a perfect token of your festive special greetings for them and gorge their hearts with glee. Heart-gladdening Blossoms such as 3 White Carnations, 2 Pink Lilies, 3 Pink Roses and chic Filler Buds constitute this Bunch. With this present of Lively Bunch of Amazing Flowers, transmit, in a comely maneuver your heart-felt feelings to an individual you view in a distinctive hue. 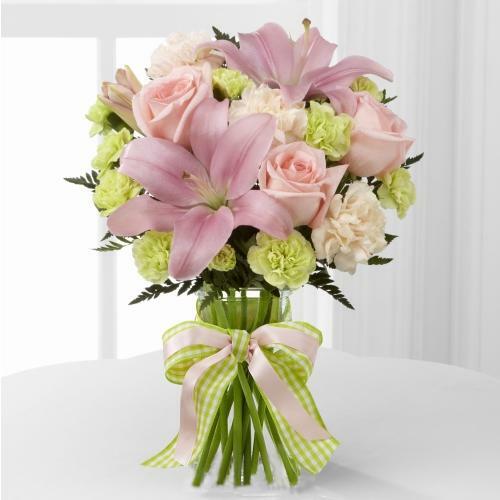 This Bunch exhibits mind-bracing Flowers like Pink Roses (3), White Carnations (3), Pink Lilies (2) and is further adorned with petite Filler Flowers with Small Cadbury Celebration. With this present of Lively Bunch of Amazing Flowers, transmit, in a comely maneuver your heart-felt feelings to an individual you view in a distinctive hue. This Bunch exhibits mind-bracing Flowers like Pink Roses (3), White Carnations (3), Pink Lilies (2) and is further adorned with petite Filler Flowers with 1/2 kg Black Forest cake.